Standardized test scores are a crucial part of college applications, as they help admissions officers gauge a prospective applicant’s academic proficiency. As such, it is absolutely crucial that students do everything in their power to maximize the scores that they present on their college applications. One thing that students can do is evaluate which test- the SAT or the ACT- paints the best picture. Once students determine which test they’re better at, they can then dedicate themselves to improving their score for that specific exam. AIM helps students to determine which test is best for them, and to work on maximizing their score on that test through classes and tutoring. For some students, test scores fall within a “judgment call” range, which means that there is no distinct advantage in choosing either exam- the choice is up to the student in this case. In other cases, there is a marked advantage in choosing one exam over the other. Concordance tables help students decide which exam best reflects their academic ability. With the replacement of the old SAT marked out of 2400 with the new SAT marked out of 1600, the concordance between the two exams has been reevaluated. Students who plan to apply to colleges in 2018 and have already sat the old SAT exam must now choose whether to keep their old SAT score, to take the new SAT exam or to switch to the ACT. Those who haven’t done the old SAT can use concordance tables to figure out whether the ACT or the new SAT is the better option based on their scores in both tests whether real or practice. The concordance diagram below provides a reference for students who have taken the new SAT and the ACT- practice or real- and allows them to determine whether taking one exam over the other gives them a better chance of standing out to admissions officers. At AIM, we offer test bias assessments which are useful in determining which test is better suited to a particular student. 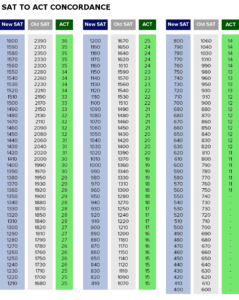 Use this chart by searching for your ACT score on the horizontal axis, then moving upwards to the row with your SAT score, listed on the vertical axis. If your scorse fall in the green zone, then you will get better results from the ACT. If they fall in the blue zone, you’re best suited to do the new SAT. If your scores fall in the grey area, there is no marked difference in your performance on the two tests, and it is up to you to choose which you prefer to do. 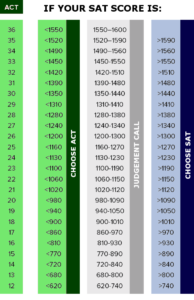 You may also determine whether the ACT or the new SAT is best for you by using the following table. Start by finding your ACT score in the leftmost column, then move across to the range in which your SAT score falls. Use the labels to determine your path forward. The table below is useful for students who have taken the old SAT and need to decide whether they need to continue testing and which test to take. It provides the concordance between old SAT, new SAT and ACT scores. For lower scores, data isn’t available to produce a valid concordance. Choosing to do the test that will make you stand out most among other candidates can possibly be the difference between an acceptance and a rejection. Once a student determines which test is better for them, they are able to dedicate their time and energy to familiarizing themselves with that particular test through repeated practice, coupled with focused classes and tutoring. Here at AIM, students can sign up for test bias assessments which help determine which test is best suited to their skill set. When this is done, they can then work on maximizing their score on the test that they are better at through tutoring and classes. AIM does tutoring for both ACT and SAT, and classes for SAT. To ensure that you have a winning college application, let AIM help you chose the test that is best for you, then work with you to sharpen your skills and increase your score. 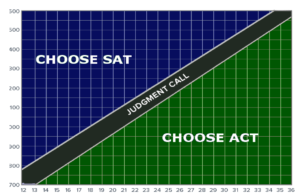 Hey Buddy!, I found this information for you: "Choosing Between the SAT and the ACT". Here is the website link: http://www.aimeduservices.com/academic-advice/choosing-sat-act. Thank you.